Welcome Pinnacle Clients to the TRISTAR Risk Management Family! City of Hope is leading the fight against many cancers through research, treatment and education. Inspired by this vision, TRISTAR has been supporting the cause for the past 20 years. 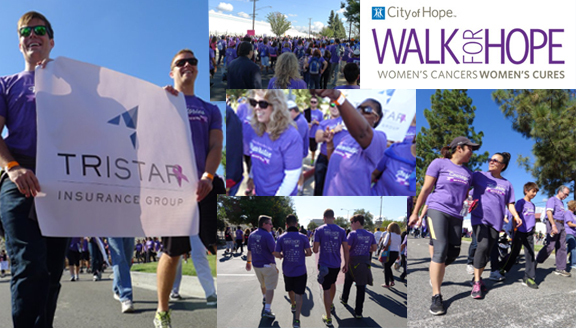 On November 2nd, 2014, several TRISTAR team members, their families and friends joined the Los Angeles Walk for Hope event – which promotes a healthier lifestyle through regular exercise and raises funds to help others with these diseases. “It’s a privilege to participate in the Walk for Hope event - to be able to make a difference for others, to promote this cause, and to take a stance on what we believe in. Not everyone has the opportunity or the ability to contribute to events like these. We are truly fortunate,” mentioned Tom Veale, President of TRISTAR.